This edition: Kirkland Seasoned Rotisserie Chicken, which is made from 10 separate ingredients that we’ve broken down in the exact order they appear online. 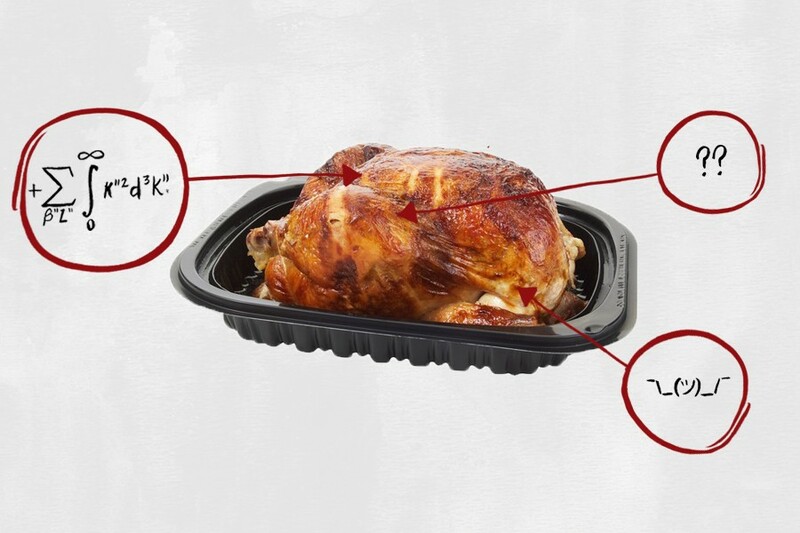 1) Whole Chicken: Fun fact: Costco’s rotisserie chickens weigh about three pounds, which is nearly twice that of those sold at Whole Foods and Kroger. Oh Costco, you never let us down. 2) Water: This keeps the chicken moist. 1) Salt: This is added for flavor. 2) Sodium Phosphate: Sodium phosphate is a generic term that may refer to any sodium salt combined with phosphoric acid, which prevents the growth of mold and bacteria. They’re usually added as texturizers and emulsifiers, allowing for the uniform dispersion of numerous ingredients (and spices). One study suggests phosphate additives contribute to the prevalence of chronic kidney disease, and the FDA even issued a safety warning concerning the use of over-the-counter sodium phosphate products to treat constipation. All in all, this is an ingredient to be wary of. 3) Modified Food Starch (Potato, Tapioca): Modified food starch is extracted from the source (potato and tapioca, in this case), then treated physically, enzymatically or chemically to partially break down the starch. It’s typically used as a batter to give foods a light, crispy texture (which explains why this chicken’s skin is Goddamn irresistible). 4) Potato Dextrin: Dextrin is a starch that’s been broken down by means of chemical reaction. It’s often used to provide a gloss (or shine) to baked goods — or in this case, chicken — and certain types of dextrins are used as carriers for flavors, spices and colorants. According to a recent study, potato dextrin “lowers feed intake” [i.e., makes you eat less], which may help support intestinal health and prevent obesity. 5) Carrageenan: As Dagan Xavier, ingredient expert and co-founder of Label Insight, previously told us, “Carrageenan is widely used in the food industry for its gelling, thickening and stabilizing properties.” Some animal studies argue that there’s a connection between carrageenan ingestion and inflammatory bowel disease; however, the FDA lists the ingredient as a Generally Recognized as Safe Substance (GRAS). More recent human studies take the FDA’s side on this one. 6) Sugar: This is added for flavor. 7) Dextrose: Dextrose is a sugar derived from starches, like corn. Fun fact: Dextrose has a high glycemic index, meaning it quickly raises the blood sugar levels, so it’s used in IV solutions to treat low blood sugar and dehydration. People with diabetes might also consume dextrose tablets to raise their blood sugar levels if they become dangerously low. Because of this blood-sugar-boosting effect, consuming dextrose also provides an almost immediate jolt of energy — then the inevitable crash. All in all, this is neither the healthiest, nor the unhealthiest chicken on the market. The skin is the most worrying part, since it’s saturated in several craving-inducing ingredients like sugar and salt. But if you’re willing to skirt the skin, this chicken is relatively untampered with (and, y’know, for five bucks, it’s a pretty good deal).